This subject got quite a lot of discussion, but there's probably still room for additional thoughts. It's an important question: how do you have no hard cap on research benefits in a game that -- unlike the typical 4X game -- has no defined win/lose ending state? MyNameWuzTaken wrote: Someone explain to me how the factions are deciding how much to spend in those kill contracts? is that a plug for the time being, or are they actually valuing their budgetary contributions? Actually, that gets me thinking. It seems odd to me that all cultures attaining the level of interstellar spaceflight would have murder-for-hire Craigslist boards. Any culture respecting life with legal force would immediately go after any person or organization soliciting contract killings. I understand we're talking about a game here, and that the "contract board" is a well-established trope, especially in MMORPGs. Even so, something about all civilizations being just fine with paying to destroy the lives and property of others just feels off to me. What about the idea of two kinds of contract terminals -- regular and secret? Regular contract boards would have all kinds of contracts except those that call for the infliction of damage on someone else's life or property. These boards would be publicly available to anyone not being actively pursued by the local police. Secret contract boards would be private boards that could be hosted by a person or faction, and which could hold contracts of any kind, including destructive ones. You'd have to gain the trust of such a person/faction before they'd give you the location of their contract terminal. But once you have it, you can access any of the missions on it, including the usual destruction missions. Note: there ought to be some inherent danger in doing so. If the local police discover a rogue contract terminal with destructive missions on it, maybe the owner of that board becomes kill-on-sight, and anyone who has offered or accomplished a destruction contract is fined. This would tilt gameplay in LT a bit toward non-destructive play. I'm not sure that's a good fit for the kind of game that Josh wants to make. On the other hand, it would give a little more zest to blowing things up -- there could be additional kinds of gameplay related to covering up your lucrative but destructive deeds... or hacking datalogs for evidence of such deeds. Lum wrote: As Josh said, since retaliation isn't implemented, they have nothing to lose, so they throw a lot of money to destroy the competition. That's a greedy and violent AI for you. Other AI's could be exactly as much as greedy, but maybe with higher ethic standards. Since the pool of things to put in missions are little varied at the moment, the direct way is the 1st option to reach the ultimate goal. The released game will be balanced and the AI will have a lot of tools at their disposal. That being said, a powerful AI-corporation with the "right" traits and personality combination plus lots of money to spend and lots of security assets as bonus could do exactly the same because, you know, balanced or not: badasses are badasses. It will take a lot of enemies and effort to counter such a modus operandi, but that's also how things are in the real world. Okay that's not an answer to what I asked, and all things I understand already. Apparently they are just plugs at the moment. It seems odd to me that all cultures attaining the level of interstellar spaceflight would have murder-for-hire Craigslist boards. Any culture respecting life with legal force would immediately go after any person or organization soliciting contract killings... etc. Not quite where I was going either. Very good thoughts, but I'm talking about the mathematical calculations in place that helps the AI figure out what they want to fund the kill contract with. 1. asteroid ring gives a great sense of scale. Towards the end of the video the player is very far away and you can still see them wrapping around the back of the planet. 2. screen tearing when near the planet is quite noticeable. 3. at some points the camera acts like it's decoupled from the ship (i.e. you can look left and see the dust streaks moving perpendicularly): this looks good and useful. 4. I love the bigger procedural ships. 5. I find the research interface confusing. Maybe it's a case of something better understood when doing the actual clicking. It seems like it could be compacted so more information is presented at once, with perhaps a flowchart or some other paradigm. 6. the mission system sounds like it could have a lot of interesting emergent gameplay (e.g. do X but not Y: destroy certain ship but do not be observed by witnesses; or do X but only in a certain type of faction ship to frame them for the crime). Also I'm curious if NPCs will react to the player and assign missions to "do damage to player"
7. great graphics as usual. But I'm very unsure about the research progression. Last edited by Rad on Thu Jun 05, 2014 1:38 am, edited 1 time in total. I couldn't help but notice your nebulae taking a more nebulous shape! Good going! Did you notice the Screaming Ghostly Eagle Nebula? Reminds me of Sam the Eagle... But hey, great progress, I'll be watching closely how your mission system develops, I like the way Npc can generate missions and how they are "fueled" with resources. I'll give more feedback later! Last edited by TorakunSama on Fri Jun 06, 2014 12:48 am, edited 1 time in total. Rad wrote: Most things look good. The purpose of research is to find something new and (overall) better. Minor modifications of existing technology (also called "engineering") are usually routine tasks and far more controllable than "fundamental" research . In this context, I'll commit heresy and disagree with Josh about research being a grab bag. So I think small changes with equally large drawbacks as demonstrated in Update #17 should not be random, but the player should be allowed to pick a trait he wants to push (at the expense of other traits). A nice practical aspect would be that the cargo hold does not fill up with "rubbish" blueprints that went in an undesirable direction. For larger changes, I imagine "Breakthroughs" that may still have drawbacks, but the sum of all properties is better than before. Acquired by setting your goal to "fundamental research". Tend to take a lot more time and/or resources, the amount may be random. If you will, imagine that a random number of tries needed to happen until the overall improvement happened, and the failures were thrown away . In this category, having a random direction of the improvements is fine. The grab bag lives! 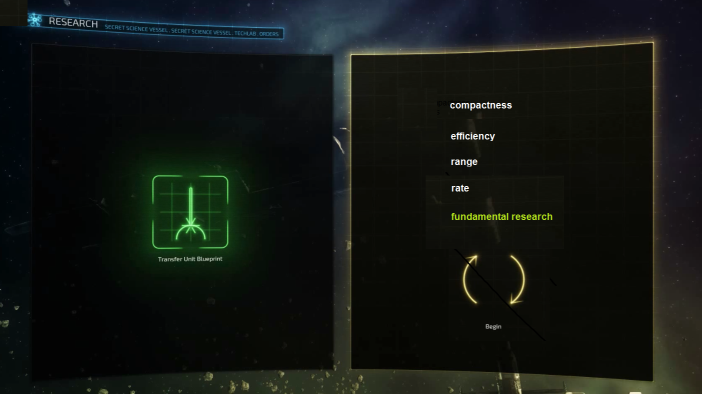 Edit some more: the selected task is highlighted in green, meaning the player has chosen to do fundamental research. Instead of just hitting "start", the user would now choose the trait to go for. Last edited by Rabiator on Thu Jun 05, 2014 8:49 am, edited 3 times in total. Otherwise you have a great idea by the breakthrough thing. Like it a lot ! But to make it balanced, fundamental research should be a lot longer and maybe cost more than engineering. And maybe there should be a limit to engineereing ? Don't you think so ? Echo wrote: But to make it balanced, fundamental research should be a lot longer and maybe cost more than engineering. And maybe there should be a limit to engineering ? Don't you think so ? Considering the limit to engineering, that could be achieved via an asymptotic function (never goes over X). With the limit, perhaps, being configurable . Rabiator wrote: For larger changes, I imagine "Breakthroughs" that may still have drawbacks, but the sum of all properties is better than before. The idea of spending time on simply altering existing technology, rather than improving it, doesn't really appeal to me. There won't be that much of a point. If there's a slight chance that your research can actually improve, then there would be a reason to research, but as it stands, simple trade-offs aren't going to accomplish anything. Researching should occasionally give you breakthroughs - it just makes it rewarding and worthwhile. I kind of feel that research advances should get smaller and smaller the farther you research, so that eventually you hit a hard limit to how advanced your technology can be. Research would focus on breakthroughs on lower levels, and focus on tweaking at higher levels. Tweaking could give bigger changes overall, while breakthroughs could give much smaller advances, but with the other values tweaked much less than regular "tweaking". At that point you can choose between tweaking and breakthroughs, and it'll help gameplay evolve somewhat over time. Yes Talvieno, we pretty much agree. I just tried to flesh it out a little and suggest a system where the player can pick what to pursue .